What is Special about Cape Town? Ideal Wave Board for Wave Kitesurfing? What about the Wind in Cape Town? Cold water in Cape Town? Waves or Flat Water in Cape Town/ Langebaan? Your Security and Crime in Cape Town? Are Sharks a problem in Cape Town? You can do also do freeride/ freestyle kitesurfing with us: learning to jump, rotation tricks, unhooked tricks). WHO WE ARE: Kitekahunas - Advanced Kitesurfing School - is based directly on the renowned Kite Beach / Cape Town, at the famous Blouberg Beach, South Africa’s premier kitesurfing spot. 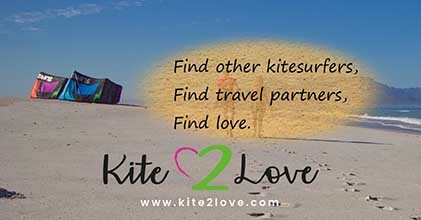 Kitekahunas is undoubtedly one of the best kitesurfing schools in the world. It is directed by German Speed Kitesurfing Champ Wolfram Reiners. We are proud that KITEKAHUNAS has been selected as the official school to educate professional kite pilots for renewable energy company OCEANERGY. To operate KITE GAS/FUEL SHIPs to combat climate change. Cape Town is different than most other kitesurfing locations in the world. Kitesurfing in Cape Town is about variety. 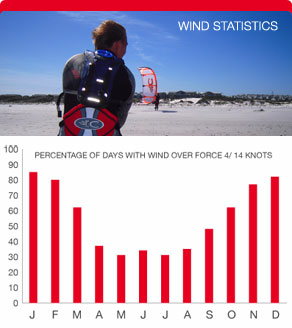 This is why most of the best professional kitesurfers are in Cape Town during our season. Cape Town offers more than 30 superb kitesurfing beaches with a huge variety of conditions: flat water, world-class downwind passages, small waves, high waves, warm and cool water ... From October till March the wind blows better than anywhere in the world. We visit some of these kitesurfing spots during your kitesurfing course or during the KITEKAHUNAS Wave Camps. You can live in one of the apartments in the beautiful Kitekahunas Beach House directly on the beach or in one of the neighbouring Kitesurfing Accommodations in Cape Town (Table View and Sunset Beach).. Looking for the most unbeatable kitesurfing holiday of a lifetime, in sun filled South Africa with beautiful beaches and Table Mountain in the backdrop? And Cape Town will entertain you with plenty of attractions to visit and beautiful people in a sizzling nightlife. A truly comfortable stay in the beautiful Kitekahunas Beach House directly on the beach or in one of the neighbouring Kitesurfing Accommodations in Cape Town (Table View and Sunset Beach). These range from budget to luxury guest houses. 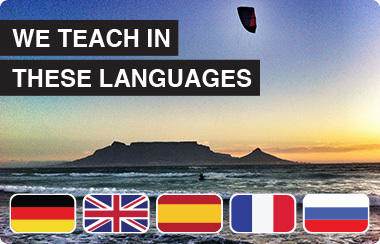 All courses primary language will be in English, but various languages are supported such as German and Afrikaans. Visit our Slingshot Shop and Test Centre at KITEKAHUNAS Cape Town. Please note that you can purchase kitesurfing equipment very inexpensive with us, while you are in South Africa. For Slingshot kites you save up to 30% as compared to Europe! You get 14% VAT back at the airport, when leaving South Africa. So if you need to purchase equipment or change your kite quiver, your savings will pay for your kitesurfing holiday or KITEKAHUNAS wave camp or freeride/freestyle camp. Please ask or our 2-page-info-sheet about equipment. Windfinder does not take local jet effects into account. 13 kn are about 20 kn in reality and if windfinder predicts 20 kn the the wind will blow with 30+ kn. KITEKAHUNAS has been selected as the official school to educate professional kite pilots for renewable energy company OCEANERGY. To operate KITE GAS/FUEL SHIPs to save the world's climate. KITESURFING BEGINNERS: We recommend our 14-days combined A+B+C+D beginner kitesurfing course .. to make you a real kitesurfer. Kitesurfing beginners course A for 3 days from EUR 399 and 15 days A+B+C+D from EUR 2896. We have special prices for South African residents. KITESURFING FOR CHILDREN: Please note our special expertise for Kitesurfing beginner courses for children. All kitesurfing A+B+C+D courses begin on Saturday morning and run for the duration of 15 days. All KITEKAHUNAS Wave Camps are flexible, you can begin any time. Space is limited to 7 people per Wave Camp and in the beginners courses to 2 people per instructor or private instruction to insure a highly personalized relationship with Kitekahunas' instructors and best learning results. On wind days you will have 3-5 hours of instructions. Binding terms & conditions you will find on our page prices and dates. Prices for non-kiters or non- course-participants in the Kitekahunas Beach House are EUR 55 per apartment / night (EUR 69 in Dez-Jan). 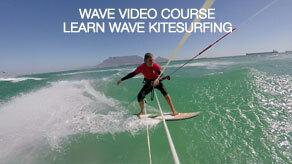 All kitesurfing courses include tuition and accommodation. Kitesurfing Beginner Course A will include all learning materials: kites and boards, harness, helmet, impact west, wetsuit and all necessary equipment needed for learning. For all other courses, including Course B, equipment will not be included. You can bring your own equipment, or purchase or rent equipment from our Shop and Test Centre. We have best-price-guarantee. Practical tuition is subject to suitable wind and weather conditions. For kitesurfing beginners we recommend our 15-days intensive, combined A+B+D+D course.This will make you a real kitesurfer. This course starts with the worldwide standard 3 days kitesurfing beginners course A, and then our our famous course B. To really get you on the board up and riding, being comfortable riding in both directions, also in moderate waves and to be able to stay upwind and maybe even do first basic jumps. This crash course will make you a fully independent kitesurfer within 14 days. Please note that you will have to purchase or rent equipment for your course B (after 3 days). You will need it anyway afterwards to practice your new sport!